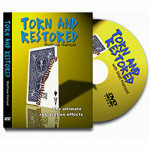 Take a bite out of a real playing card, then instantly restore it! 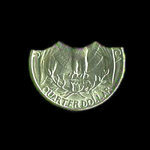 The Bite Out Quarter has become one of the most popular magic tricks ever sold. This favorite effect is now available using a playing card! It's a simple idea, and very easy to do. 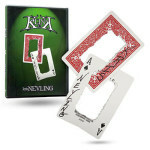 Hold a Bicycle playing card in full view, put it up to your mouth and take a "bite" out of it. Your spectators can clearly see that a bite-shaped piece is missing from the card! 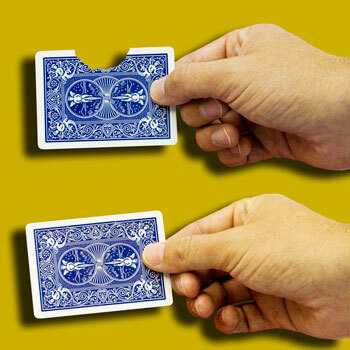 Then pass your fingers over the card- instantly it is whole again! This pocket miracle requires no fussing or resetting- you can repeat it immediately, as many times as you would like. No sleight of hand, no fancy moves, no palming. 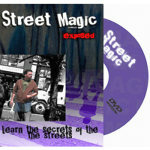 Just easy and astounding magic! You supply an ordinary deck of Bicycle cards. 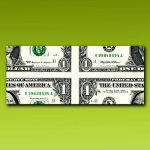 You can use the Bite Out Card by itself, starting the trick by taking the card out of your pocket or wallet. 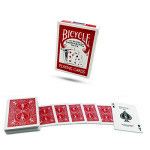 You can also place the card on top of a matching deck of Bicycle cards, then casually take out the deck of cards and remove the top one (which is the Bite Out Card) to start the trick. What a Fantastic Little Effect!!! If you're a Card Magician and if you've ever seen the now famous Bit Coin Trick (which is also sold by MagicTricks.Com) then you know what it is to feel a little envious - Gee, I wish I could do that only with a card. Well, now thanks to this great gimmick you can!!! (Why should Coin Magicians have all the fun???) 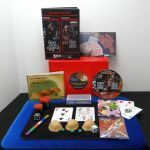 The effect is very easy to do, Peter performs it superbly, the card is very well made, and sturdy, and unlike Bit Coin does not require additional rubber bands. 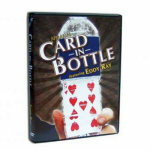 Great as an ice breaker, gag, quick opener, or can be worked into any other card routine! For added !WOW! add some slight of hand to switch the gaff card with a normal card and hand out the normal card for inspection, but on the face of the normal card with a fine point permanent marker trace out the bite mark (Aces are best for this) - this will freak them out! 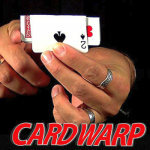 Thanks to MagicTricks.com for adding another great tool to the Card Magician's tool kit!